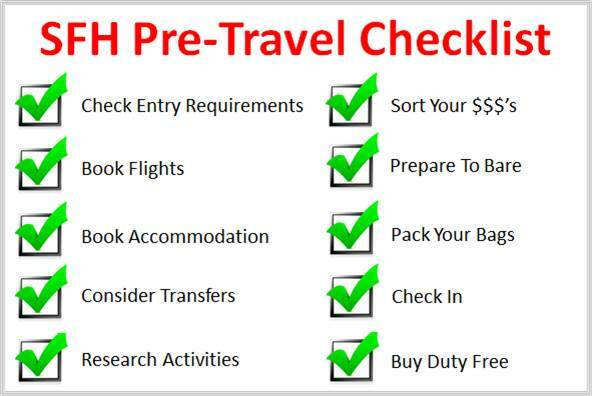 The basics of my pre-travel checklist are always similar, with slight variations to suit the destination. One thing I can’t stress enough is to research, research and then research some more before you go. The internet is a wonderful thing and the amount of information available on-line is virtually limitless, almost daunting in fact. When it all becomes a little bit overwhelming, narrow it down to my ten MUST DO’s before visiting Phuket. All visitors to Thailand require a passport with at least six month’s validity. Generally foreign citizens also require a visa, however certain exceptions apply. Australian’s can enter without a visa provided their stay is less than 30 days. More information here. 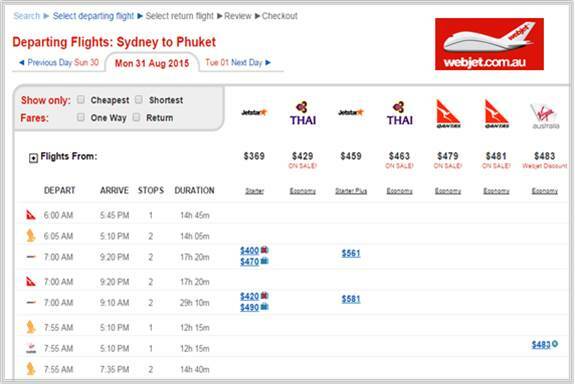 Jetstar fly the Sydney to Phuket route direct and Singapore, Thai, Air Asia, Virgin and Qantas all offer 1 stop options, often code share. Given it’s already a 9 hour flight, I would need to be getting a serious bargain (sub $350pp return all in) to even consider a stop over. You can pick up return flights for around $900pp any day of the week but I never pay full price. We booked in December 2014 with Jetstar and paid $1,150 for two return tickets including all the extras (luggage, seat selection fee and the exorbitant credit card fees!). One of the best ways to compare all airlines in one place is to visit Webjet. Their site is easy to navigate (see below) and displays each airline side by side making it simple to compare. Don’t forget to sign up for each airlines emails to be the first to know about special offers. The best deals are offered for a very limited time and will sell out quickly so if you see a great deal jump on it without delay! Getting a good nights sleep and having a haven to retreat from the madness of the streets is vital to get the most out of your Phuket holiday so spend some time to pick your accommodation wisely. Try Webjet, Expedia, Agoda and Hotels Combined to make that research a little easier and never pay full rack rate. Once you have narrowed your options, check the reviews on Trip Advisor to see what other travelers think. One thing that constantly irks me about hotels in Thailand is that the beds are rock hard. And I mean rock hard! I have slept on the floor before because it has been softer! I have resorted to googling “hotels with soft beds in Patong” but have not had a lot of luck as it seems to be pretty much the norm and short of taking my own mattress along there are not a lot of options. If this is really going to be an issue for you, maybe Thailand is not your best choice in SE Asia. There are a number of regions in Phuket and these are my picks. Patong – This is the place to party but it also offers plenty for those that are not keen on clubbing until 5am in Bangla Rd. Great restaurants, eclectic markets, shopping malls and a (mostly) clean beach. Try Holiday Inn Resort, Baan Lamaii or Burasari. I’ve stayed in all three over the course of my visits and have been happy with each stay. Phuket Town – This is my first stay in Phuket Town, which I chose because of it’s proximity to Rassada Pier and an early morning ferry to Koh Phi Phi. Accommodations are fairly basic in this region but this is not an issue for us as we are only staying one night with a late arrival and early departure. Quip Design Phuket Hotel is our pick and set us back $35 (including a free cocktail!) which is a bargain in anyone’s book. Karon Beach – Leave all the craziness of Patong in your wake when you drive about 15 minutes down the road to beautiful Karon. I love Access Resort & Villas for it’s great value swim up rooms. It is a little further out along the main street but suits us perfectly as the hubs and I love to walk. Stay in the blue wing if your can. They also offer private pool villas if you feel like a splurge. Make sure you visit the ladies at the massage place right at the entrance for some well deserved pampering. Kata Beach – Another 10 mins down the road is Kata. More up market that Karon and quieter again, it is a place to truly get away. Lots of upscale luxury accommodation with price tags to match but if your budget doesn’t quite stretch that far try Kata Lucky Villas. A bit of a walk to town, but I think it is worth it for the price and you can always hire a scooter from the front desk if you wish. 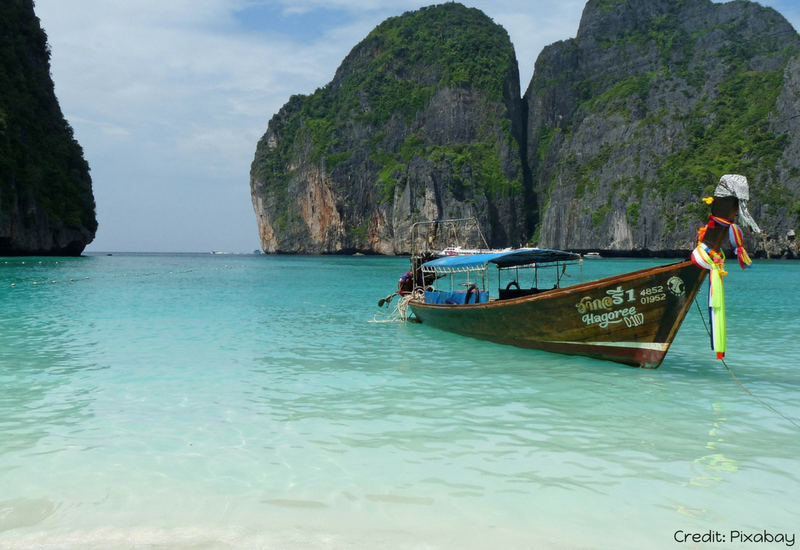 Koh Phi Phi – While not strictly on Phuket, Koh Phi Phi is not to be missed. Day trips are available but I suggest spending at lease two nights. On previously visits we have always stayed at Mama Beach and loved it but given we have a bigger group this time Phi Phi Island Cabana better suits our needs. If you want to explore beyond Phuket, check out this three week Thailand itinerary. You can grab a cab or book transport on arrival but if you prefer to avoid the crowds and the hassle book online before you go to ensure you have a man holding a sign with your name on it who will whisk you away from the madness as quickly as possible. We used Transfer Phuket Airport and paid 1050 baht for a van for six people which is not a bad deal. I’m sure you could haggle a little better if you had the inclination. While I am definitely not an advocate of planning out every second of your trip, it’s not a bad idea to do some research on what is available before you go. Everything from cooking classes to white water rafting and Vegas style shows are on offer. Some things get busy and it might be wise to book before you leave home. We missed out on Pum’s cooking class on our first visit because they were fully booked. We were smarter on our second visit and booked a couple of weeks before we left home. Be aware that Thailand has a dubious reputation for the ethical treatment of animals please ensure that you travel sustainably in Thailand. Thailand is a popular destination for cut price medical procedures, particularly dentistry and cosmetic surgery. If you are considering this do you research well, the savings are very attractive but be aware of the risks. Last visit I splurged on veneers at Patong Smile and I have been very happy with the result. If you are considering this I would book an initial appointment (usually free) on your very first day to ensure there is enough time to complete your treatment should you chose to go ahead. The local currency is the Thai Baht (THB). Each Baht is split into 100 Satang. 1 Baht = AUD 0.04, USD 0.03 and GBP 0.02. Credit cards are widely accepted but may attract a small fee. The best option is a combination of both cards and cash. You can of course buy some cash before you leave home but ATM’s are plentiful and available at the airport. If like me, you have your savings accounts attached to your credit card (so much easier just carrying one card!) make sure you check which account the ATM is dispensing your funds from to avoid costly cash advance fees. Not all ATM’s offer the option to select a withdrawal from your savings account, so if you don’t see this option simply cancel and check the next one. Once you find one that works remember it! Most of my overseas getaways involve escaping winter for some fun in the sun and I tend to let the normal beauty regime slip a little in the cooler months, so if you are like me, you are going to need a little prep before you hit the beach. First up you are going to want to super hydrate parched winter skin. Do a full body exfoliation the week before and amp up your daily moisturising routine for the whole week. Even if you don’t normally wax you should consider it before embarking on a trip. The freedom of being able to enjoy 10 or so fuzz free days and leave the razor at home is worth it. A spray tan is a worthwhile investment because it will assist in avoiding a nasty burn by curbing your desire to over bake skin that hasn’t seen the sun for months in the first few days. You will find it very difficult to find a spray tan in Patong (I have looked!). You can’t even find the bottled stuff in the pharmacy’s. Thai’s are obsessed with being lighter not darker and the potions on the shelves reflect this. If you are in need of a hair colour I would recommend getting it at home with a stylist you know and trust but more basic hairdressing options are abundant and cheap in Thailand so you could leave the blow dry until you get here and save a few dollars if you so chose. Same goes for mani’s and pedi’s but prepare to pay extra for shellac and Opi. Pack some sunscreen in your toiletry bag because it is fairly pricy in Thailand. Thailand is very casual so you can get away with packing light, think shorts, tanks, t-shirts and summer dresses and of course your swimmers. You could do a week with just carry on. I don’t, but you could. Check your allowance and weigh your bags. I also take a travel scale to weigh the bags for the return journey. Budget airlines are notorious for stinging you with exorbitant excess luggage fees and those bargains are not going to look so cheap if it costs a fortune to get them home. Trust me, I have been stung before. A power adapter is a must and a power board is a bonus. If you are a chocolate connoisseur like Mr SFH take the good stuff from home. American’s need not bother with this step given your chocolate is pretty awful anyway so you will probably do just fine with the local offerings. If you are carrying food make sure you read the entry forms carefully and declare anything that is required to be. Most airlines allow you to web check in before hitting the airport and it’s always a conundrum for me. Jetstar operates two lines at the check in counter, one for those who have already web checked and one for those that haven’t and which ever I chose to do everybody else on the flight has as well meaning I am always in the longest line! The solution? Head to the airport without checking in and scope out the lines. If the non web checked is shorter just go with it, if not join the web check queue and check in on your smart phone as it inches along. Jetstar’s international web check closes 2 hours before departure. If you are lucky enough to be flying business class (or above!) this is not going to be an issue for you, join your special short queue and smile smugly at all the plebs in cattle class! Every good bargain hunter knows that every dollar saved can be funneled back into more purchases, so with that in mind don’t overlook duty free purchases when travelling overseas. You can of course do this nice and early but I always do it at the airport. Hey, I’m going to be there anyway with an hour or so to kill between check in and boarding and since I have lost all my lounge privileges what better way is there to while away the time than with a bit of shopping. Sydney Airport is currently under going renovations so the duty free store is in a bit of a shambles but it’s still worth a visit. The best bargains are on alcohol, cigarettes and cosmetics. My favourite Dior moisturiser is around $50 cheaper than retail. So I bought two! Make sure you check the current allowance for Thailand before you buy because your bargain will not look so good if you are hit with duties and fines for exceeding the allowable limit! Don’t forget you can also buy duty free at Sydney Airport after you land, so if you don’t intend to use your item during your trip this could be a better option to save you needlessly lugging your purchases thousand of kilometres. Did you also know that in some instances you can claim back your GST on ordinary purchases made in Australia over $300 up to 60 before departure? Read all the rules to see if you qualify and if so, keep your receipts and head to the TRS desk just after X-Ray. Thailand also operates a similar Tourist Refund Scheme so 1. Keep your eye out for stores displaying a “VAT Refund for Tourists” sign if buying goods over 2,000THB. 2. Ask for a P.P 10 on purchase (you will need to show your passport). 3. Get your PP 10’s stamped when passing through customs. 4. 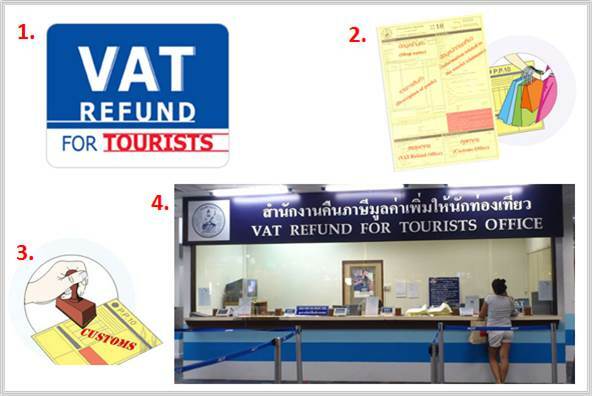 Submit your claim at the VAT Refund For Tourists Office at airport before boarding. More information here and here. Now you are all set to go! And if all else fails in terms of your preparation don’t stress. I always say that as long as I have my wallet, my passport and my phone everything else is a bonus. Do you see yourself visiting Phuket soon? Or have you been? I love to hear your thoughts in the comments below. Disclaimer:This post contains affiliate links, which may result in a commission. Items marked C/O have been provided free of charge. All opinions are my own. very useful tips. I am planning a trip to Thailand, Phuket in this or next year. Although I will fly from a different destination and a different country, so the flights that I have to look for, the currency conversion and all will vary for me. But then I can follow the same steps and have the same checklist to make sure I am not missing anything. Thanks for putting it all together. I thought Phuket area was my favorite part of Thailand until we spent a week in Chiang Mai. I can’t wait to go back to either. This is such a great comprehensive post!! I would really love to do Thailand and will be book marking this one for sure! Very valuable! Nice tips. While I have visited Thailand before, I haven’t as yet made it across to Phuket. Sounds like a nice little break to take and I will be able to have a look at this list again before heading over. It’s perfect for a quick trip to Oz and Koh Phi Phi is fabulous!